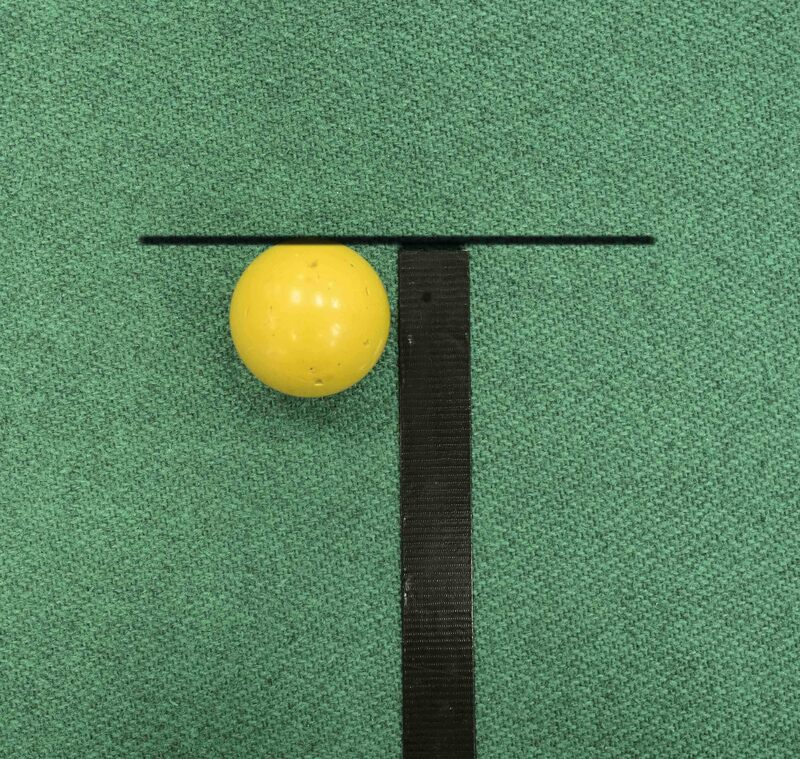 NEVER stand around the head guessing which bowl is the shot, get down and measure ASAP, that keeps the game moving and you will have an accurate result fairly quickly. When measuring always measure three times (if two bowls are in question). 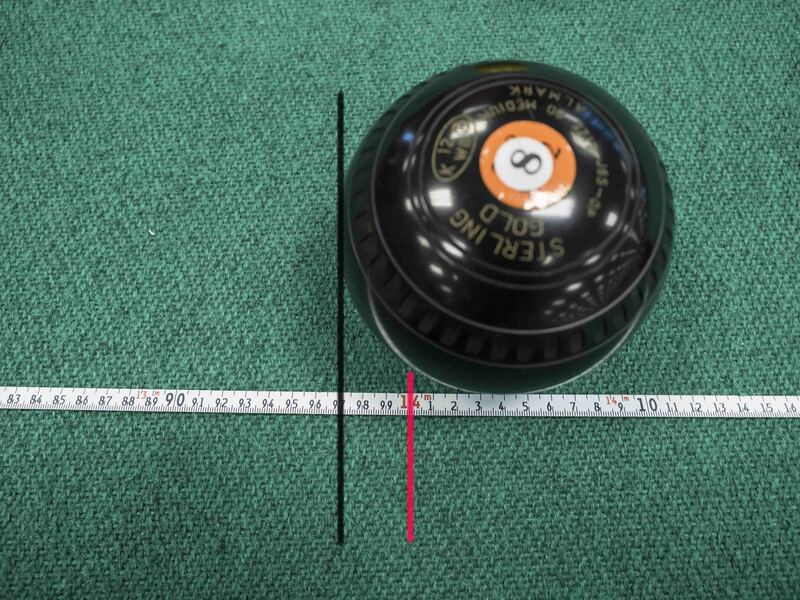 Two times to find out which is the shot bowl and then back to the first (without adjusting the measure) to check if your measure was correct. If a bowl looks as if it might fall ALWAYS use a wedge or wedges, even a pencil or hankie can be used, I have even see someone prop their wallet under a bowl. Remember, if you cannot agree the shot call an umpire. If one is not available ANY person can be used. 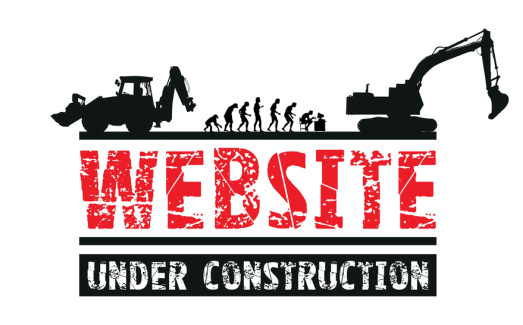 Though it is obviously preferable that they do know what they are doing. Also remember ALL players MUST STAND AWAY from the head until the result is known. 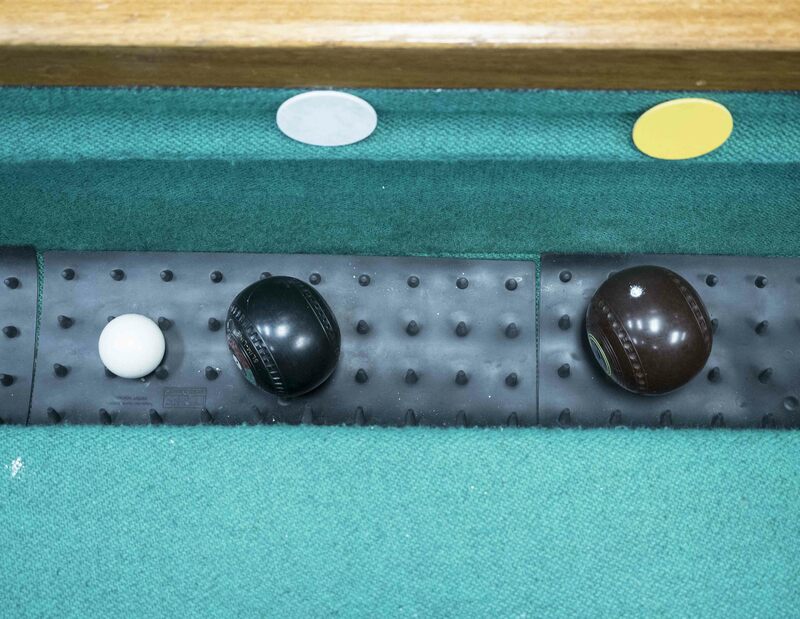 Usually the umpire will remove the shot bowl or in case of a tied end they will remove the jack. On a very rare occasion you may not be happy with the way your opponent does the measure. Don't make a nasty comment just ask "do you mind if I double check it?" If they were slightly dishonest - OK cheating, they will soon see that you spotted it and stop cheating. Again, if in doubt call an umpire. When you have to measure a bowl always move the pointer of the measure sideways and up and down to ensure you have the nearest point of the bowl to the jack. 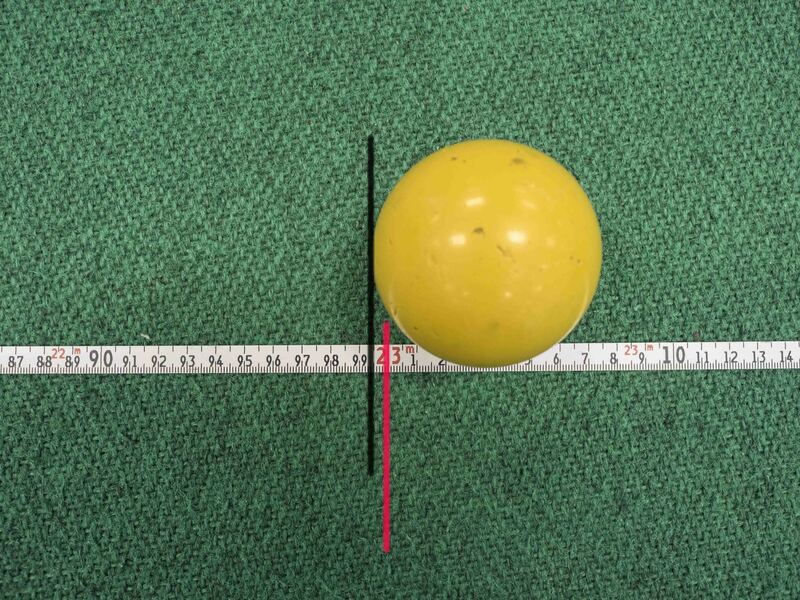 For measures over 1 metre or 1 yard it may be beneficial to wedge the jack too! If the length of the jack has been challenged, out comes the tape. The end of the tape should be held touching the centre of the front of the mat. The tape is then wound out. If the part of the jack nearest the mat is over 23metres then the jack is legal. Remember it is centred before the measure takes place. See photo's below. If the distance of a bowl is challenged the same situation occurs, except the bowl is (obviously) not centred. The measure it taken from the centre of the front of the mat to the nearest part of the bowl to the mat. If it is less than 14metres it is removed. See photo's below. Rather than use feeler gauges, use some white plastic to put under the bowls / jack. Usually the shot will become obvious. If no white plastic is available use the feeler gauges open, but held flat under the gap between the jack and the bowl. See picture below. A toucher must be marked or nominated as soon as it comes to rest. If the next bowl comes to rest before it is marked or nominated it is no longer a toucher! Touchers should be marked on BOTH sides of the bowl. If it falls into the ditch with a single mark down it may be lifted in error. Always mark on both side as per the picture below. 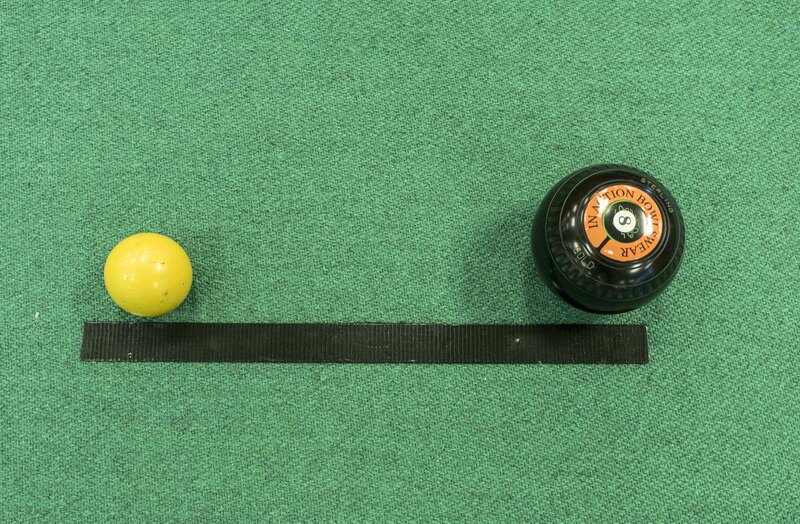 If the jack or a toucher falls into the ditch within the confines of the rink a marker must be put on the edge of the ditch so that it can be seen from the mat. 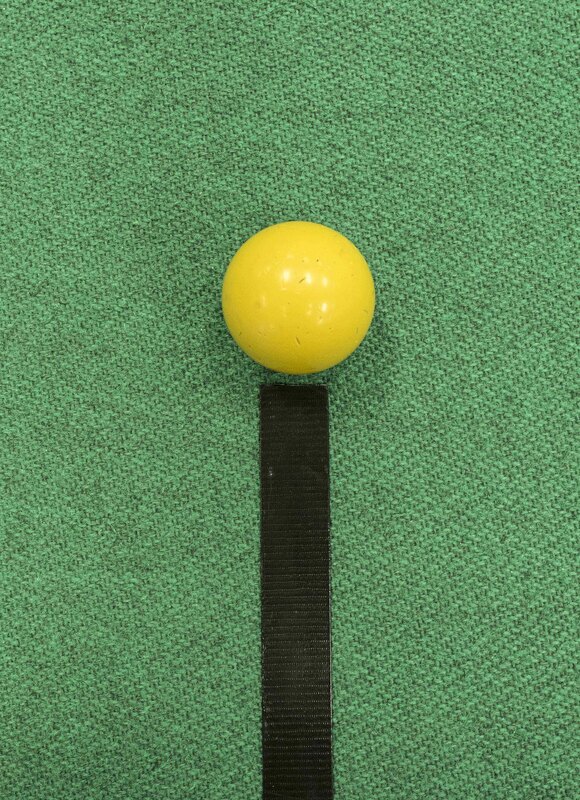 A white marker is used to show the position of the jack and coloured markers used to indicate touchers if needed. If he jack or one of the toucher bowls is moved by a non-toucher they can be easily be replaced. If however a jack or bowl is moved by a toucher falling into the ditch the marks should be moved to the new position. When the bowls are less than 4 inches (100mm) or less from the jack you may not be able to get a measure in, in this case it may be beneficial to use callipers. If using these make sure the hand furthest from the tips is resting on the ground to give some stability. Placing the jack causes confusion at times. If placing at the 'T' on the carpet the front of the jack facing the mat should be level with the top bar of the 'T'. If on a 2m stick the front of the jack should be level with the end of the stick NOT placed at the end of the 2m stick. See picture under. If the bowls are more than 1 metre or 1 yard from the jack it will be easier if two people do the measure. One at the jack and the one at the bowl being measured. If a bowl is apparently out of the side of the rink a player from the opponents side should check from the furthest point from the bowl. It may be preferable to use a mirror or even a periscope. In an extreme case a string can be run between the rink markers and then the set square used. 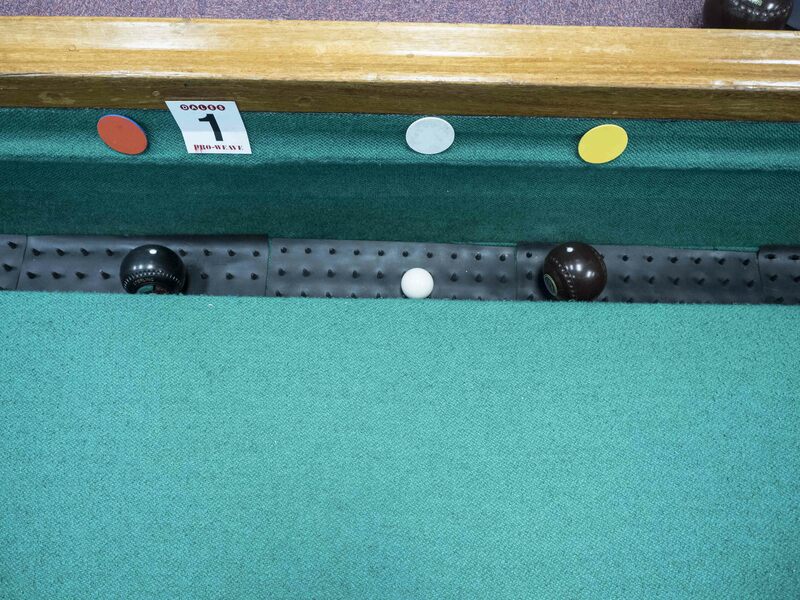 Remember, if any part of the bowl overhangs the playing rink then it is counted live. There is often a call against a player that it is though to be 'foot faulting'. This is almost impossible to prove unless it is filmed and replayed in slow motion. Remember; ALL or PART of a foot must be ON or ABOVE the mat at the point of delivery. That is when the bowl leaves the players hand. A string measure, ditch measure, assortment of wedges, (I use foam hair curlers with wire inside). Pieces of white plastic cut from a container. Chalk and/or chalk spray. 30m tape, Callipers, Feeler gauges, magnifying glass, & a set square. The end of the tape it held in place at the middle of the mat furthest from the back ditch and nearest to the jack. Remember, before measuring the jack it should be centred. The tape is run out in a straight line to pass close to the jack but not touch it. In this photo you can see that a black line passes across the front of the jack (that it the side nearest to the mat). Here the front of the jack is seen to be 22.95 metres so the jack is not legal! In each case the red line indicates the 23 metre point. In this photo the line passing across the front of the jack shows (that it the side nearest to the mat) HAS passed the 23metre mark and is actually at 23.05 metres. A tiny amount of difference and a tape not pulled tight and straight 'could' make a difference. The jack should always be placed correctly on the 'T'. We often see it dropped on the 'T' but rarely placed correctly. Here is an example of an incorrect placement where the jack is NOT 2 metres from the back ditch. The red line shows where the front of the jack SHOULD be! When using the two metre stick to place the jack we often see it placed here at the end of the stick. Remember the rules state that the jack, meaning the front of the jack should be two metres from the back ditch. Here the jack has been placed incorrectly at 2.05 Metres from the back ditch. Here you can see the correct placement of the jack in relation to the two metre stick. The front of the jack is level with the end of the stick. Thus the front of the jack is correctly placed at 2m from the back ditch. There are occasions where a bowl comes to rest 'half way' up the green. 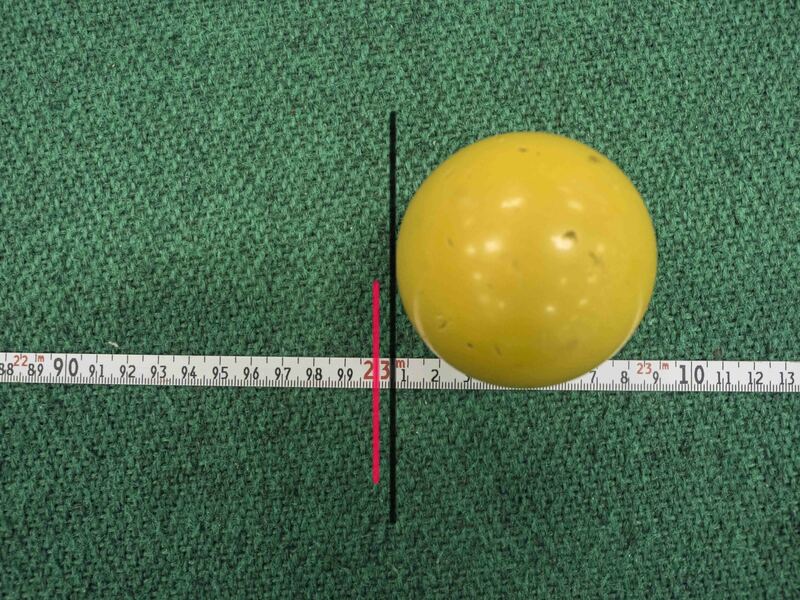 The Laws of the Sport state that the minimum distance for a legal bowl is 14 metres from the front of the mat. 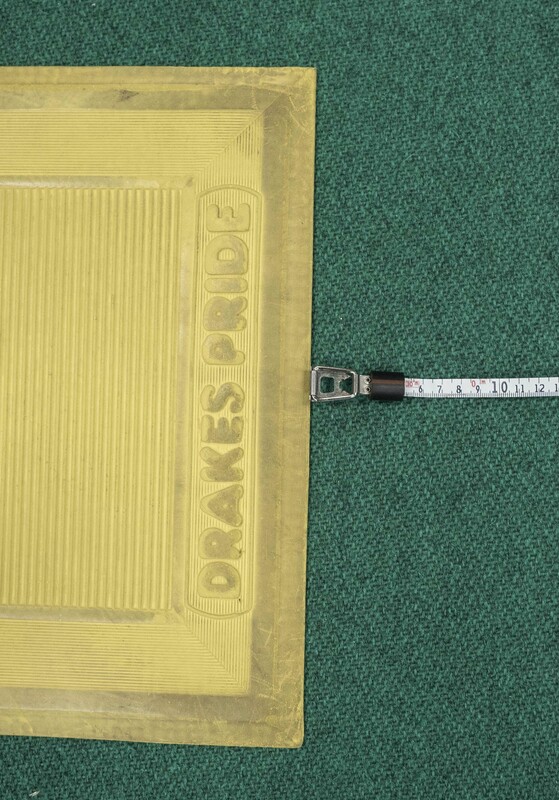 Here you can see that the bowl when measured is 13.97m from the centre of the mat. The bowl is of course NOT centred. In this case the mat is at the bottom of the picture. Here you can see two bowls and a jack in the ditch. 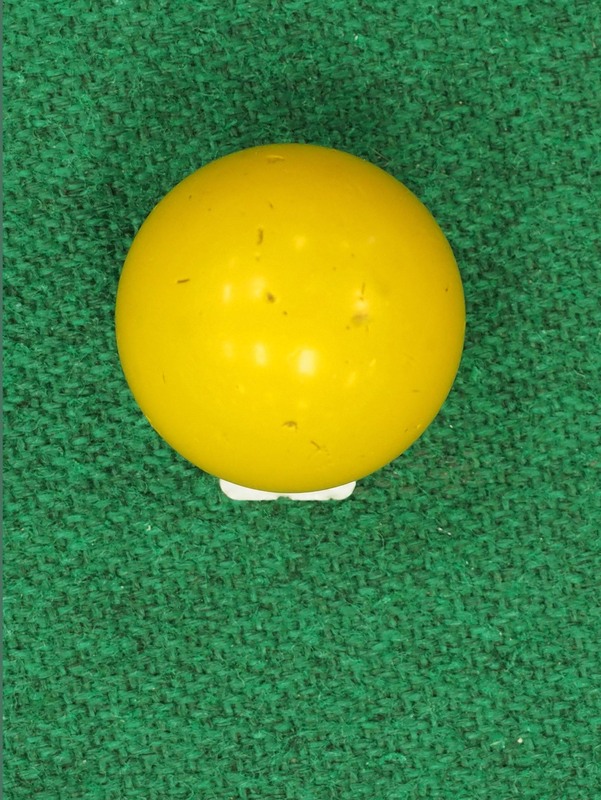 The white marker is used to show the position of the jack and the other two colours to show opponents bowls. You can also clearly see a tiny white mark on each bowl showing that they are 'touchers'. You are about to measure for shot and this is what you see in the ditch. It should be obvious that the jack has been moved from its original position. BUT moved by a 'toucher' or a 'non-toucher'. Any chalk mark might be under the bowl if only one mark has been made. This shows the reason for two chalk marks. 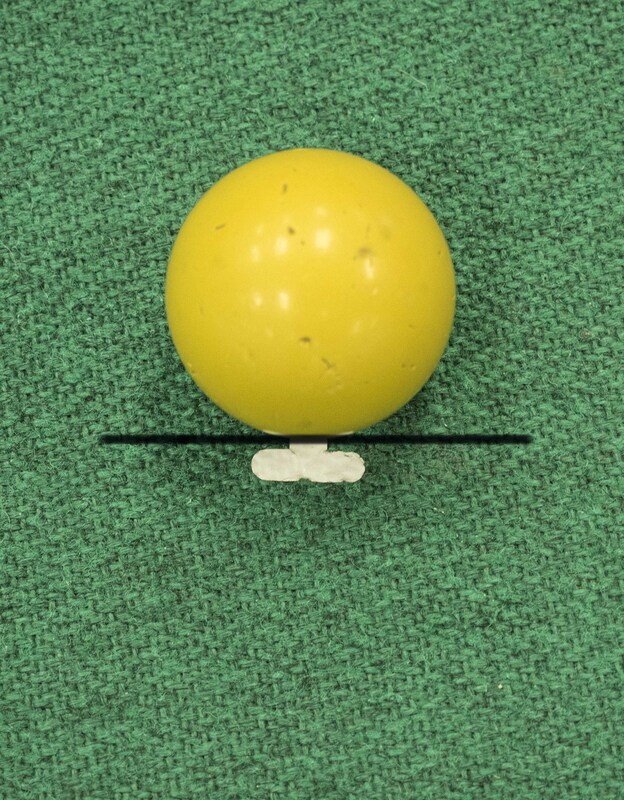 Also if the left side bowl is not a 'toucher' it should be removed and the jack replaced back under the white marker.